< Previous Post Previous post: Sonic Generations Launching on Nintendo 3DS November 25th in Europe? Next Post > Next post: Sonic Snap! Win A First4Figures 20th Anniversary Sonic the Hedgehog Statue! GAME and GameStation are part of the same group. I already have the note book, don’t worry, it’s not that great. I’ll be in Australia around then.. who wants in? Guess that means New Zealand get it too since we get all the Australian releases. I’ll have to pop in to my local EBGames and place a preorder. Wheres the love Sega, Wheres the love? No retailers in Spain are listing this yet, so without knowing the retailer, we don’t know if you’ll be able to ship it from there to other countries yet. Australia is a PAL region, just like Ireland and the game will definitely be in English there, so your best to order from EB Games Australia. “If an order is placed outside of Australia or is placed using a credit card with a billing address outside of Australia then it is considered an overseas transaction. Try your luck and see if they accept your order. I’d imagine the above text is just legal crap. We’ll have to wait and see. 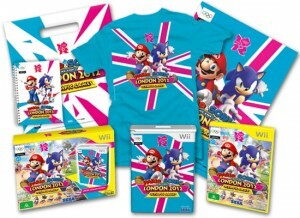 Right now we’ve only seen the GAME Group (GAME, Gamestation and Gameplay) offering the t-shirt. Your best bet is through their Twitter @SEGA. Oh man, I already preordered Sonic Gen which I only have to pay another 70 dollars off of. GRAH!